My birthday hasn’t arrived yet but we celebrated anyway while my parents were visiting for the weekend. 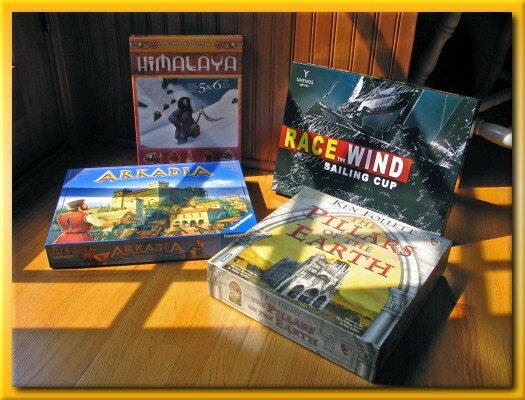 Lisa and the kids surprised me with The Himalaya Expansion for the 5th and 6th players, Race the Wind, Arkadia, and Pillars of the Earth! Thanks! After several attempts at getting together we finally had a few die-hards make it out for May’s game night. It been such a long time since we’ve been together that we ended up just talking for awhile and didn’t get started going through the rules for Caylus until almost 8pm. It was only my third time playing and teaching the game but the rules are pretty straightforward and I felt like I still had a good grasp on how to teach the game. Mat ended up having to leave early though. He’d injured his back and was in quite a bit of pain sitting for so long. I like Caylus quite a bit. I always feel like there are so many options during your turn that it’s difficult to get trapped into a completely wasted turn. Every game I have managed to get myself into a position of needing a coin or a cube to ‘buy’ a king’s favor or build a building only to realize that I don’t have the necessary resources because they will be activated after the point that I need them. I’ve been bitten by that many times but I’m not seeming to learn from my mistakes. In any case, I still really enjoy playing and can’t see myself tiring of it for quite some time.